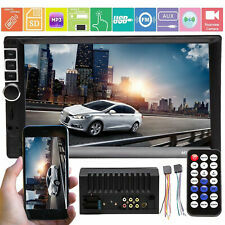 7 inch HD digital TFT LCD touch screen, dynamic menu interface, AUX audio input interface can add MP3, mobile phones, music players and other audio input, include Free the rear view camera. Support GPS Navigation with Externa the GPS antenna..
Intra-bluetooth for hand blues: When you enter your car, you just need to quickly connect to bluetooth to answer hands-free calls. Compatible with iPhone and Android phones to land the call. 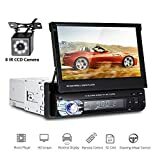 It's more practical and safe..
7-Audio performance: This car audio which builds in high quality stereo audio, allow easier access to high fidelity audio. Have fun!. Full digital electronic control search radio stations, high-performance digital tuning FM radio automatically scans, 18 stations memory..
USB support large current output, can charge for mobile phone (Note: Some phones may not charge, please know). 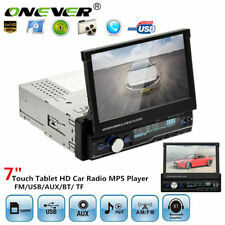 Car Radio GPS Player Power supply voltage: DC12V DC, (24V need to add transformer) Support GPS navigation system, Bluetooth, eversing video input, LRC lyrics and ID3 display 24Bit DAC, high-precision reduction fidelity sound quality Support APE, FLAC, WAV, DIS lossless audio formats, support high bit rate! Sound quality to fever level CD level Support 24Bit 96KHz WAV format, music resolution more than CD Audio playback: APE, MP3, WMA, ACC, FLAC, WAV, RA, AC3, MP2, AMR and so on Video support playback: AVI, MP4, FLV, PMP, RM, RMVB, MPG and other formats Support TF card, high-speed USB2.0 interface compatible with a variety of U disk, mobile hard disk, support hot-swappable New design modeling, knob volume adjustment A variety of sound adjustment (SEL): electronic volume, treble, bass, left and right balance, front and rear sound field Full electronic digital search radio station, high-performance digital tuning FM radio automatic scanning, 18 radio storage AUX audio input interface can be an external MP3, GPS, mobile phones, music players and other audio input 8 IR LED Rear Camera* Image sensors: 1/4 "color* TV system: PAL* Minimum lighting. Android 8.0 Operating System, The Most Powerful Hardware,New UI,Good DVR Included(DVR019). 4G RAM DDR3/Octa-Core/32G ROM,DVR Input Ready,Wireless Screen Mirroring (Smartphone Entertainment Sharing). Google Play Protect,Added Security,Bluetooth For Bluetooth Calls and Music. Dual Camera Switch,Steering Wheel Control Ready. 7 inch Touch Screen and 1024*600 Superior Visual Enhancement. Please Note: This unit doesn't have a DVD drive. 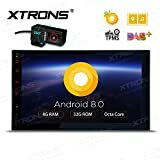 The latest Operating System - Android Oreo The XTRONS TE706PL is powered by the smarter, faster, and more powerful operating system Android 8.0. You will be in for the smoothest user experience ever experienced on a head unit. The Most Powerful Hardware With the on-board Octa-Core processor and its 32GB ROM memory, the TE706PL achieves ultra-fast running speeds with a smooth and efficient multi-task processing ability, satisfying even the most tech savvy users. Faster Performance Android Oreo minimizes background activity in the apps you use least and gets started on your favorite tasks more quickly with twice the boot speed when powering up. Steering Wheel Control The Steering Wheel Control function allows you to take easy control on switching songs, changing radio channels and adjusting volume from the buttons on your steering wheel. This provides convenience and safety by allowing you to keep your hands on the wheel. DVR Input Ready The XTRONS TE706PL comes with a dedicated DVR input, making it simple to connect a XTRONS DVR to the unit. Once setup, this feature can capture events that occur whilst driving, providing safety features such as collision footage. Note:Need DVR019,please search it with ASIN:B078MJLF2C. OBD2 - A Window for you to Diagnose your Car Status Note:Need OBD02, please search it with ASIN:B015MU8UN6. Tire Pressure Monitoring is Available After you have correctly installed the TPMS in your car, the sensors will automatically monitor tire pressure and temperature, and transmit real-time statistics to the receiver so that you can see the real-time data of your vehicles' tires on this unit. Note:Need TPMS01, please search it with ASIN:B01NBASD0J.